Holland’s jumping point for this collection was the 1998 film of Hunter S. Thompson’s hedonistic odyssey Fear and Loathing in Las Vegas, and this cinematic inspiration was clear from the get-go as tonnes of genuine sand was shipped in to the venue for that Nevada desert-scape vibe. But it didn’t stop there, of course. Johnny Depp’s sunglasses, cigarette holder and bucket hat ensemble in the movie is endlessly appropriated by too-cool-for-real-dress-up Halloween party guys but also, it seems, the fashion world: sure enough, there was a smattering of those most polemic of hats that require the thickest skin to wear (trust me I would know…), but also a predominance of long white tubes-socks – exaggerated versions of what Johnny wears in the movie. 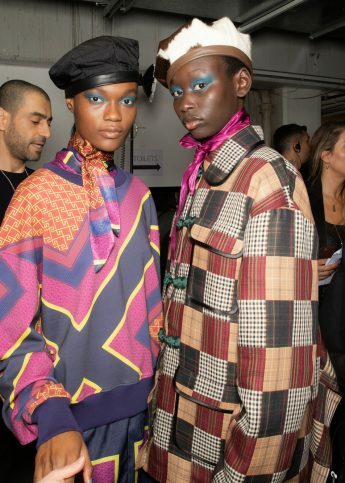 Beyond these more obvious visual touchpoints, Holland seemed thoroughly enamoured with the film’s “psychedelic…and eccentric” atmosphere, presenting pieces in a range of vivid florals, stripes, and even a few leopard print skirts and boots for good measure. Large bug-broaches stuck onto an array of jackets and dresses, meanwhile, felt like some trippy hallucination in the Fear and Loathing context, as did many of the shoes which seemed to be sprouting out purple feathers and various other disorientating protrusions from the ankle. A dressing gown-like, blue velour, leopard number aside, there were also some more restrained designs on show; the desert-adventure quality of the whole thing was nicely filtered into safari-jackets and shirts with spread collars presented in luxurious fabrics like suede and belted at the waist. Equally, I certainly never expected to see what amounted to a khaki gilet at a Henry Holland show, but over a voluminous print skirt complete with oversized pockets taken straight from a combat jacket it made sense. It’s always good to see that the man who kicked off his career with explicit-slogan t shirts hasn’t lost his playful-mojo.